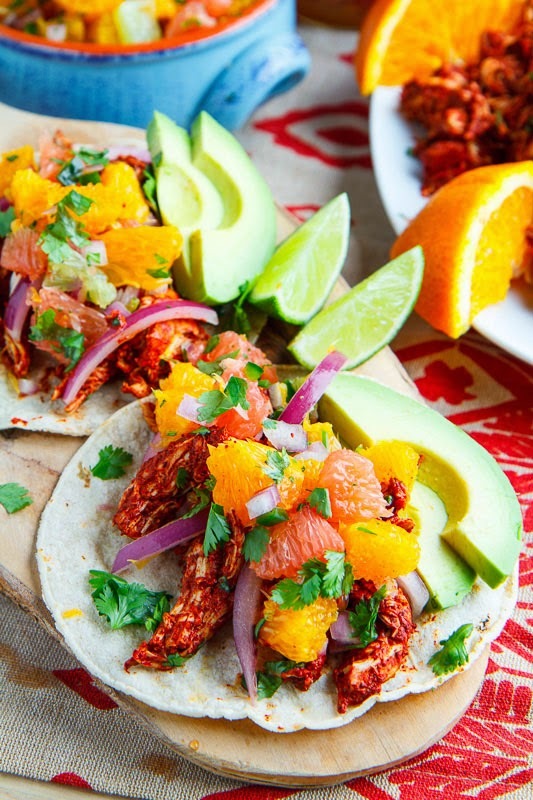 Slow baked pulled chicken tacos in a tasty orange and annoto/achiote sauce with pickled red onions and a fresh citrus salsa! Are you still looking for an idea for your Cinco de Mayo celebrations tomorrow? 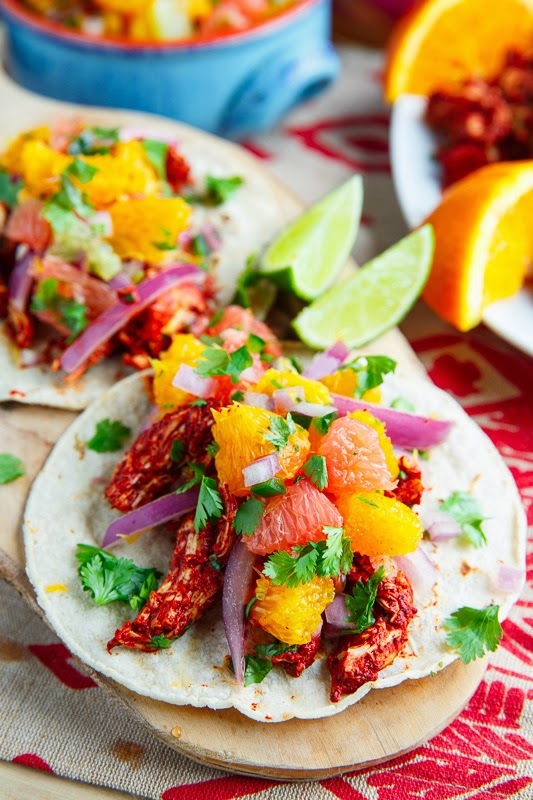 I’ve got another one for you, these pollo pibil (chicken in achiote) tacos with fresh citrus salsa are perfect! 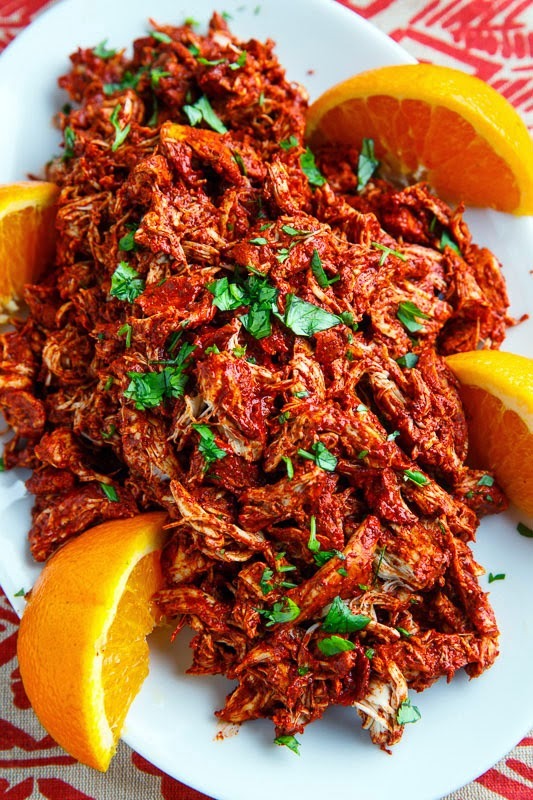 The chicken in these tacos gets it’s red colour from the tasty achiote paste which includes annatto seeds, which is a natural red dye, and the paste is dissolved into sour orange juice and used to marinate the chicken. Once the chicken has marinated it is traditionally wrapped in banana leaves and baked until fork tender before being shredded and served as desired. (If you cannot get ahold of the banana leaves aluminum foil also works and it’s what I use.) 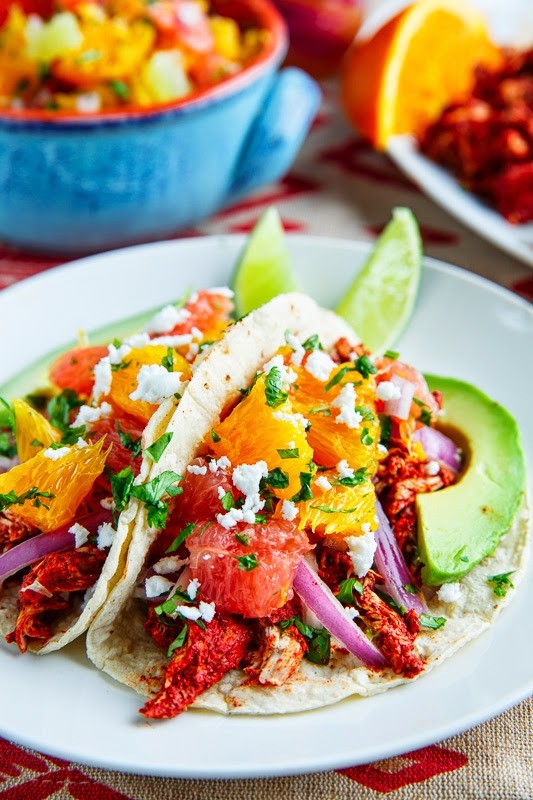 Given the citrus ingredients in the marinade I like to continue with the theme and serve the pollo pibil tacos with a sweet and tart citrus salsa with oranges, grapefruit and limes along with some tangy pickled red onions. 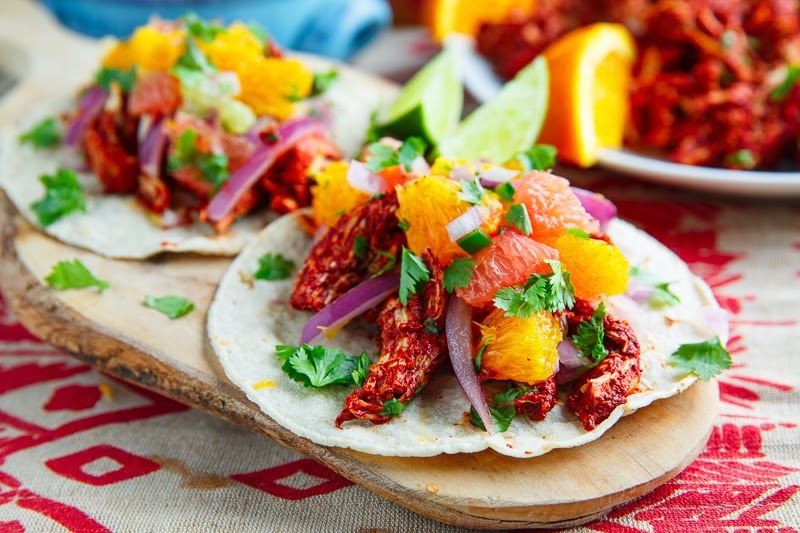 The combination of the achiote chicken and the bright, fresh and sunny citrus salsa is a fabulous one and these tacos are sure to be gobbled up by everyone that tries them! Despite how angry, red and spicy this chicken looks, it actually does not have any chilies or heat to it but if you want it to be as spicy as it looks feel free to add some habanero salsa to the tacos! Note: You should be able to find the achiote paste in the Mexican section of your grocery store or at a local latin american grocery store. Feel free to dress the tacos up a little more with avocados and queso fresco! Marinate the chicken in the pureed mixture of the achiote paste, orange juice, lime juice, garlic, cumin, oregano, cinnamon and salt for 3-24 hours. Wrap the chicken and marinade in 2-3 layers of aluminum foil, seal, place in a baking pan and bake in a preheated 325F/170C oven until fall apart tender, about 2-3 hours. Shred the chicken and mix it back into the marinade and juices, assemble the tacos and enjoy! Option: If you can find banana leaves, wrap the chicken in them instead of the foil. Option: Add other taco style toppings like habanero salsa, cotija, avocado, guacamole, etc. Holy heck these look good!! Thought I knew what my menu was, but suddenly that might have to change! Woah mama, these look amazing. That citrus salsa on top just makes this whole dish POP! these are gorgeous!!! Love that citrus salsa!